I’ve been a fan of this series for a long time now – but for me, as the series sprawled out to encompass an ever-growing multitude of towns and characters, it just felt like the narrative was meandering the scenic backways a bit too much. So you can imagine how pleased I was to find that with this book, the last installment in the Lakeside Courtyard arc (though Anne does plan to write more books set in this world, just featuring different characters), the story found home. This book is all about Lakeside, centered squarely on Meg, Simon, and the rest, and it focuses tightly on the micro, rather then the macro level. And that, for me, made this my favorite book of the series since the first. I do so like when a story brings it home. Now, to take an eagle-eye view, I do think overall this makes for a satisfying conclusion to the series, particularly on the character level – but I can also understand why some people would be frustrated by the narrowness of scope, because this story is so focused. But to my mind, that was a necessary choice, because this is a series that over time has somewhat succumbed to the wallow of epic sprawl. And what I mean by that is, when an author, in order to impart world-shattering type consequences, continually adds new characters in far-flung places in order to make us care about the large scale repercussions of Epic Danger. It’s a common problem, I’ve found, among genres of the epic persuasion (be it urban or traditional fantasy, or space opera), and the reason it’s a problem is that, as book after book goes by, and the cast grows and grows, a definite pattern tends to emerge – as people are introduced merely to then be thrown into immediate peril. And aside from being predictable, we as readers don’t have nearly enough time to get to know or care about the new characters – definitely nowhere near the level we care about the core cast – and so we end up trapped in a cycle of diminishing returns, with ever more people, more danger, but less caring. And I, for one, definitely grew ever more impatient with it over the course of this series. Now to be fair, I do fully understand the reasons for all this, as a story always need peril, and you can only have your main characters be kidnapped or threatened so many times before that starts to feel repetitive as well. But for me, it still felt like the story was getting diluted, even as it become more and more EPIC. Oh, the dangers of urban sprawl. Which again is why I was so delighted to find this story so firmly centered on the Courtyard, and focused on such a small, particularly human brand of danger. Frankly I thought it was brilliantly interesting, to see how much damage one person’s careless selfishness could do, both to the people around him and to the world at large – which by the way I think is a vital lesson in today’s world. So on a character level, I was delighted – happy to spend time with all my favorite characters, fascinated by the danger, and fully satisfied by the story. Now as for the larger wrapping up of the series as a whole – the truth of it is, I don’t think there’s really any way to firmly conclude the danger from the Others in a satisfying way. The Others will always be scary, and humanity will always be on the brink of extinction – that’s the brilliance of Bishop’s world-building – so you can hardly defeat the Big Bad or make them go away. And frankly, this series has been playing the Big Bad Boogey Others card for so many books now – the Others are about to do something really scary! No, NOW, they’re going to do something REALLY scary! No, this time, we mean it, REALLY, REALLY SCARY! – that after the fourth time the specter of human species extinction raised its head, it all had, for me, lost some of its punch. Which again was why I so enjoyed the narrow nature of the peril in this story, no less deadly for its utter pettiness, and how directly it focused on Meg and Simon and the others, though still with far-flung, devastating consequences. So I can understand why, then, some people might feel this story lacks the OOMPH of a finale, in that the macro story was hardly resolved – but I was happy enough with the character endings to call myself satisfied. 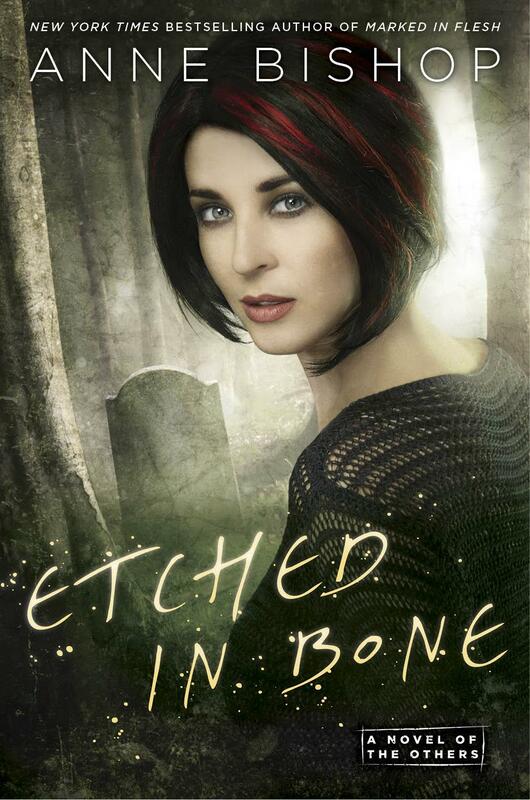 Etched in Bone gives readers an action-packed and emotional farewell to a long-running and enjoyable arc. Bottom line, this is once again an epically amazing and thrilling story, but I really hope Bishop returns to continue Simon and Meg’s unforgettable journey because this didn’t feel like a finale.